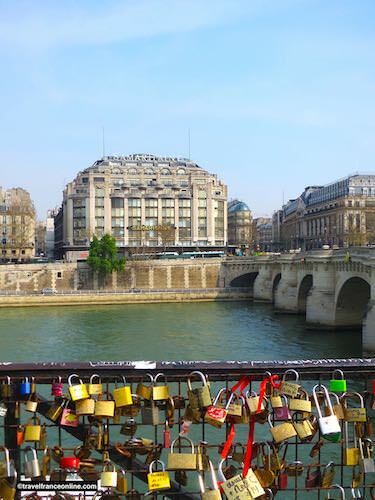 The thousands of love locks or Cadenas d'Amour tied to the parapets on the bridges of Paris were for a while the new iconic image of Paris Romantique! 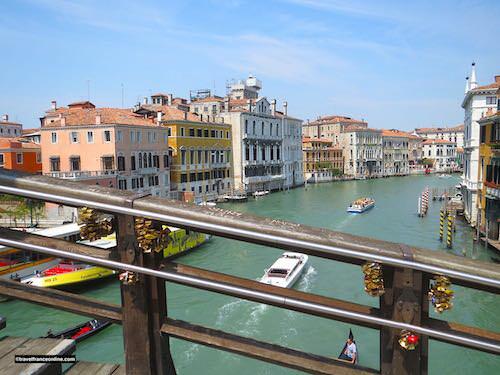 The first love locks indeed appeared in the city in 2008. 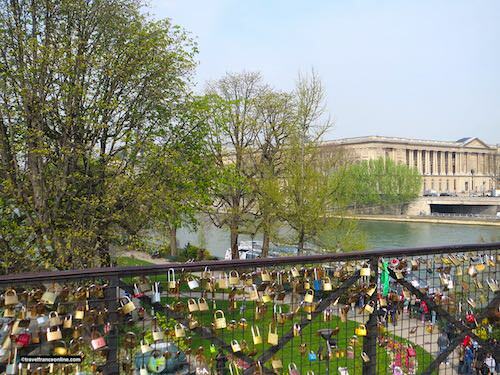 Parisians and foreign visitors wrote their names with a love message and the date on a padlock. 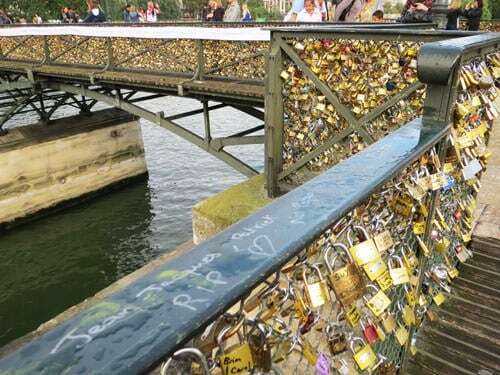 They then tied it to the parapets' fences and threw the key into the Seine, sealing their love forever. It's believed that the tradition originated long ago in Asia . 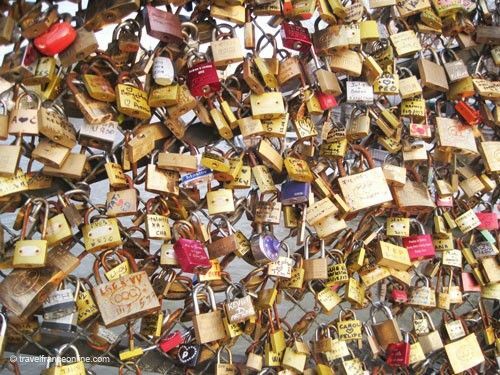 In fact, it's still widely practiced in Huangshan (China), Niigata (Japan) and in Korea, where love locks make entire sections of walls. Newlyweds propagated the 'romantic' tradition when on their honeymoon abroad. Russian newlyweds began the tradition in their own country in 2005. As a result, Moscow ended up installing metal trees when the Luzhkov Bridge 'disappeared' under love locks! 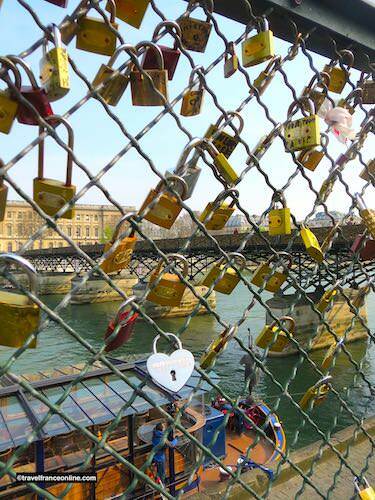 The tradition spread like wild fire in Paris, and on particularly on Pont des Arts. 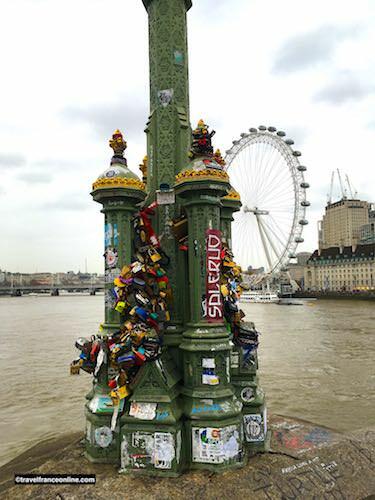 The number of padlocks increased so quickly that space soon became scarce on the bridge's parapets. 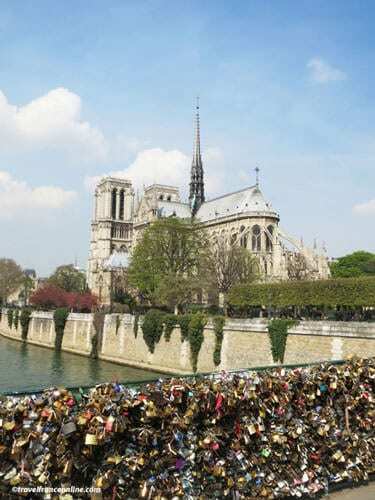 Love locks therefore appeared on the other bridges of Paris: Pont-Neuf near La Samaritaine and Place Dauphine, but also Pont de l'Archevêché by Notre-Dame Cathedral. Who removed the Love locks? 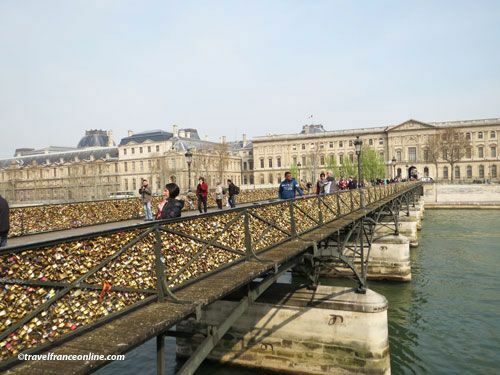 In 2011, the City of Paris contemplated removing the padlocks for fear that their weight would damage the structure of the Pont des Arts. The extent of the social phenomenon, however, led to the decision to be reversed. However, shortly after the padlocks disappeared overnight along with the fences they were tied to. Neither the police nor the City of Paris knew who removed them, and no group or individual ever admitted to the action. Lovers soon added new love locks and eventually filled the parapets. Oddly, entire sections of fence kept disappearing at regular intervals! The City of Paris hastily installed plywood boards in order to fill in the gaping holes (for obvious safety reasons). The disappearance of the padlocks has remained a mystery to this day! Interestingly the padlock tradition triggered the appearance of a new trade. An army of padlock sellers indeed set up their stalls by the entrance of the bridges! 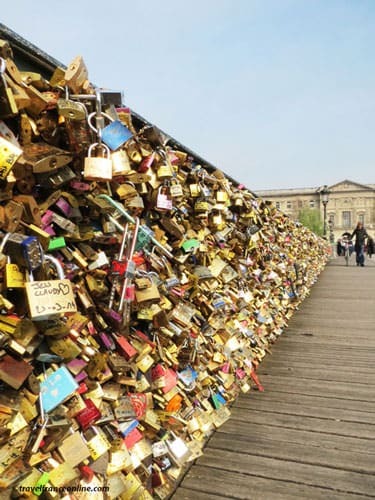 Love padlocks might be romantic, however, they triggered major safety issues! It is quite difficult to appreciate that these tiny shiny locks represented a load of about 255kg per meter of fence. Entire fences would therefore regularly collapsed under their weight, as on June 9, 2014. 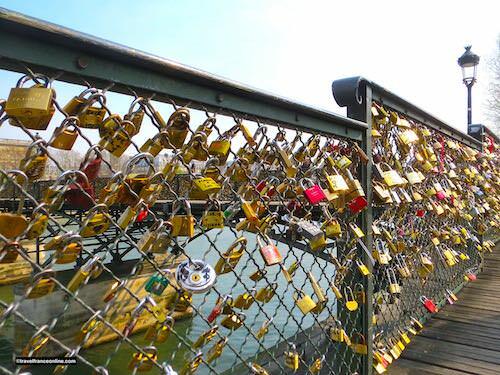 On that day, the 155m long Pont des Arts could have entirely collapsed under 79 tonnes of excess metal! This accident prompted the City of Paris to clear the bridge of all the locks in 2015. However, the mayor is looking for an alternative location, as the tradition has indeed become a Must Do when visiting Paris. 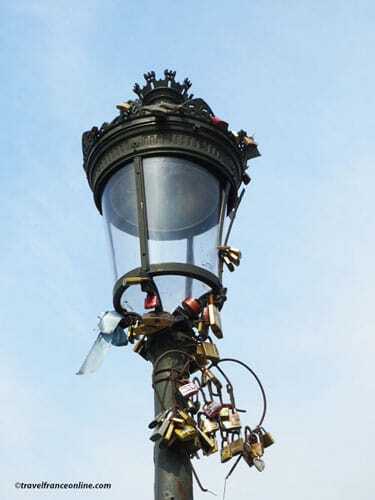 That said, many Parisians and tourists are delighted with the removal of the locks. They've always thought that they transformed the bridges, and now many lamp posts, into a public dump ground! The Pont des Arts now serves as the venue for temporary art exhibitions.